I find that when I have a good book to read, I am less likely to be wiling away useless and mindless hours on the computer. A good book engages my imagination and whisks me to places I may never visit otherwise. So, what exactly have I been reading lately? -Mirage by Clive Cussler. I am a sucker for adventure novels. I don't know why. I really don't. Mirage is one of the Oregon Files, a series that follows the adventures of the HMS Oregon and it's crew. Non stop action and excitement. -Elizabeth of York by Allison Weir. I must confess that in the 9 weeks I had this, I didn't quite get it finished. But, it is a fascinating read. Elizabeth was the daughter of a king (Edward IV), sister of a king (Edward V), wife of a king (Henry VII) and mother of a king (Henry VIII). Every monarch of England and Britain since her time (late 1400s) has descended from her. To say she was an influential woman is an understatement. She was not an Eleanor of Aquitane, but she has done her part to shape history. I'm impressed. Now I just have to check out the book again so I can finish her story. -John Adam by David McCollough. This is what I am currently reading to the kids. We are about 100 pages in. If we are faithful and miss a minimum of our lunch readings, we should finish this book about the time we finish school. John Adams was a character. He wasn't as well liked as Jefferson or Washington or Franklin, but he made significant contributions to our country during and after the revolution. And he married up. Abigail Adams was quite the woman! -Selected Poems by Robert Frost. I already alluded to this yesterday. -Blink by Malcolm Gladwell. Malcolm Gladwell presents interesting theories in his books. And his writing style is very engaging. You learn without knowing it. Blink was about how we can make accurate split second decisions. And why our split second decisions are sometimes not good. My favorite book of his so far was Outliers. Then Blink. Then David and Goliath. I still have to read Tipping Point. -The Splendor Falls by Susanna Kearsley. This was a fictional book set in modern day France with connections to the Plataganets and WWII. It caught my eye on the new shelves at the library and I really enjoyed it. It was light and fun, and I actually got through it in less than 8 hours (which included dinner and dinner prep.) And of course, I always love a history connection. -The Bourne Retribution by Eric Van Lustbader. (say THAT 10 times fast). What can I say? Another adventure novel, another Bourne novel. The Bourne books are way better than the Bourne movies. (I laugh every time Phil watches Bourne on DD. He should read the books.) I am always excited when a new book comes out. I have not cracked the spine on this one yet, but it will happen this week. -Sadie's Secret. This was another that resulted from my perusal of the new book shelves. I haven't read it yet. Christian fiction. Probably okay. -A Short History of England by Simon Jenkins. I'm not sure if I will sit down and read this one from cover to cover, but I will read the sections on 1600-1800, and then refer back to it in subsequent school years. So, that's what I am reading currently. 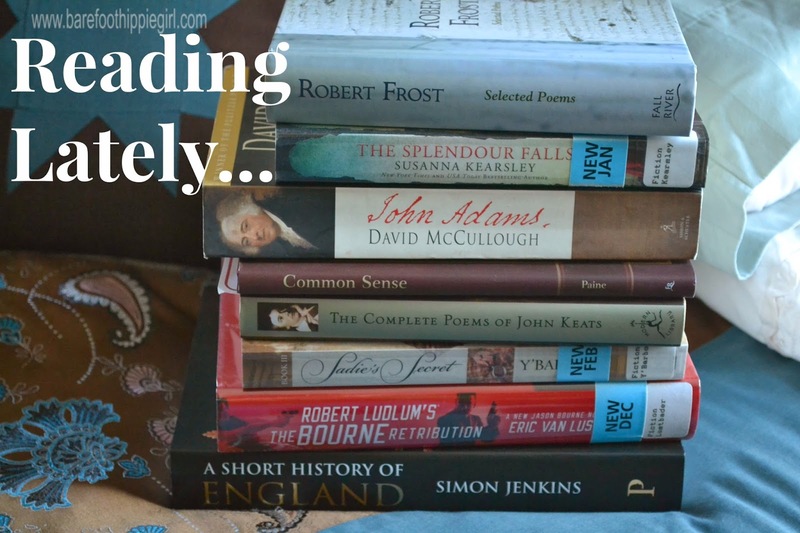 What have you been reading and enjoying? Do you find that you unplug more from technology when you have an engaging book to read?